Attach items to paper, wood, cloth, pottery, and more with the non-toxic adhesive of Elmer's Washable School Glue. Specially formulated to be washable and easy to use, Elmer's School Glue perfect for school projects and home arts and crafts. 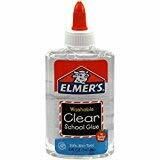 Elmer's School Glue is adjustable before setting and does not run, delivering reliable results with every use. Two 5-ounce bottle of Elmer's Clear Washable School Glue.